As many of you have read my herb garden disappeared off my porch last week. At first I was angry and then I called my mother-in-law. She has heard many of my grips over the years and she is always a reassuring presence when I am upset. When my mother passed away 9 days after my oldest was born she quickly stepped in as my support system and has remained there ever since. Immediately after hearing about the theft of my herbs she headed to the Farmer's market. She showed up at my house with a big herb pot overflowing with herbs. Somehow she had gotten the whole pot for 5 dollars. Never underestimate the ability of a West Virginian woman to be able to haggle, it really is an art. She apparently also shared the theft of my herbs to everyone selling plants and came to my house with more than enough plants to start a great new garden plus the pot that was already started. The man that sold the herb garden that was already potted had done a great job starting the pot, but it needed to be cut back, trained and nothing was labeled. So that has been my pet project this week. I have Googled and learned more about uses for herbs than I ever knew before. It turns out that I have over 15 different herbs in the pot, some of which I have never used before. So this week you will be seeing a lot of recipes using fresh herbs. This morning I tried a new recipe for Blackberry Scones with Cinnamon Basil. This recipe has 12 ingredients. It takes 35 minutes of total time, 10 minutes of which is active. I did make a few changes to the original recipe. The largest change I made was to use gluten free all purpose flour. I did not add the salt since I find with gluten free flour I do not need it. The second biggest change that I made was to greatly reduce the amount of butter. The original recipe uses 1 1/4 cups of butter. While this would be delicious, it would be too much butter for gluten free baking (gluten free recipes tend to need the butter reduced). I also wanted to make it a better breakfast option and reducing the butter to one stick (1/2 cup) allowed for far less total fat content. In addition I used non-fat Greek yogurt. Finally, my dough was a lot stickier than the pictures in the original post. This is normal for gluten free baking, just make sure to roll the blackberries in a small amount of flour before adding them to the batter to keep them from bleeding and turning the dough purple. My husband loved these. Since I made so many changes they are basically biscuits, not traditional scones. However, even my kids loved the scones and didn't notice that they were eating basil in a breakfast food. I would suggest that using strawberries would be an even better flavor combination. There is something about strawberries and basil that seem to go hand in hand. Overall, this recipe was a great way to use fresh herbs and could be changed to include other types of basil or berries. 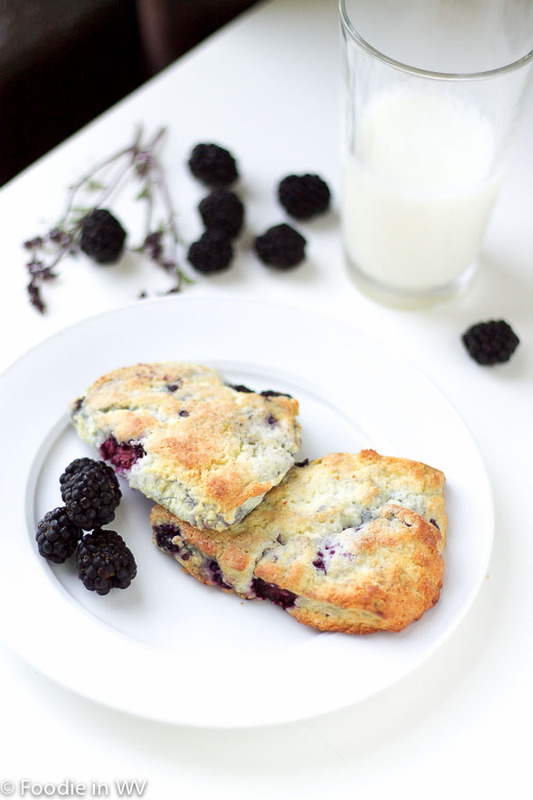 For the recipe go to Blackberry Scones with Cinnamon Basil. They turned out really well and were a nice way to bake with basil! My mother had a bunch of lavendar. I loved when she dried it and made little pillows to put on my bed. It was so soothing! Someone actually stole your herbs? Seriously? That is terrible. Having a good mother in law is priceless. These sound delicious! I've never used cinnamon basil, I'm definitely intrigued! I have to see if I can get my hands on some!! I had never seen it until my mother in law bought it at the farmer's market. It has a really great taste! These look delicious! Sorry to hear about your stolen herbs, I can't believe someone would do that- so selfish. I will look forward to all you herb recipes, I havea few but never know what to do with them! I hope that they are using it instead of selling it for money. In our city it could go either way. She does have great haggling skills :) My husband has inherited the same talent, me not as much! Oh yes! These look amazing! Thanks :) My husband keeps telling me that they were the best gluten free thing he has ever eaten! These sound really interesting. I have to admit that I've never gotten the hang of using herbs, so I don't ever think of adding them. They really are easy to bake with, you just have to find the right recipe. These look just delectable! Adore baking with blackberries! We are big fans of blackberries in our house too. They are delicious in so many baked goods! What a sweet mother-in-law...I was lucky enough to have a dear one as well. Your scones sound like a lovely way to start the day with a cup of tea. Aww, what a sweet MIL! Glad to hear you got your herbs back. I cannot believe someone would be brazen enough to steal it from your front porch. These scones look incredible! She is a sweet mother in law I agree :) Thanks for the sweet comment! Scones are one of my favorite things! I never would have thought of that flavor combination. I will have it give it a try! I love scones too, especially with a cup of coffee or tea! I found you from the Wednesday Walkabout, and your pictures have me DROOLING!! I'm excited to follow you and get some more new recipes to try - especially gluten free options! Still can't believe someone stole your garden. It just sounds ridiculous. Anyway, I love scones, esepcially anthing with berries. Yum! Scones with berries are a favorite of mine too, they are so good! Lucky girl to have such a sweet MIL! I am so into using basil with fruit these days. I have been going positively nuts on the strawberry basil popsicles I made last Friday. Thanks for stopping by my blog! Can't wait to read more of your stuff! I love basil and fruit, it's a great combo! Your popsicles sound yummy! I used to buy scones everyday too :) I was in love with maple nut scones! Thanks for hosting :) The flavor combination really is great! The gluten free changes you made to the recipe sound great and I love the idea of strawberries instead of blackberries! Will have to try that variation. Thank you for posting the link to my blog! No problem :) Your recipe turned out great! Love blackberry anything! These loook oh so good!!!! I'm a big blackberry fan also, especially when they are in season! They look absolutely scrumptious! Loving them!